On the 30th and 31st on July my cultural expansion grant took me to London to participate in one of the UK’s biggest cycling events. 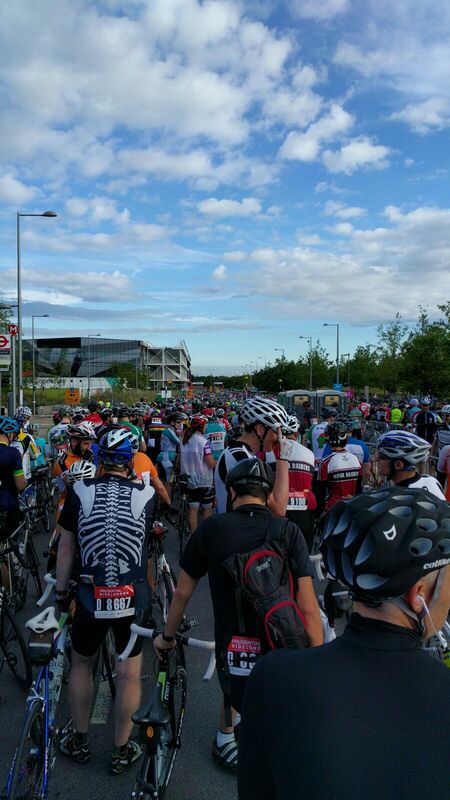 RideLondon is an annual three-day festival of cycling which began in 2013 as part of the 2012 Olympic legacy. My weekend began at ExCel on the Saturday at the pre ride cycle show. Along with thousands of cyclists of all ages and abilities I checked out the exhibitors, watched the programme on the live stage and generally managed to ‘forget’ that the next day I would be joining 26,000 cyclist at the Olympic Park to ride 100 miles through the country’s capital, on closed roads made famous by the Olympic Road and Time Trial races. But whilst my weekend started there training had of course started weeks ago. The weekend catered for a range of abilities and there are also family cycling events through London on the Saturday, but I had chosen to bike 100 miles, and only a numpty would undertake that with no training. Entry to the ride is through ballot application and I’d been cycling for a year at the point I found out I had a place. Commuting to Spring whenever I could gave me two hours cycling a day but only a maximum distance of 15 miles – I needed to get my distance up. So I found my local cycling club and joined them on their Sunday rides, cycling anywhere between 40 and 60 miles. A few months later – and after a marathon trip cycling coast to coast in Italy in just 4 days – I felt better prepared, but still daunted as my longest ride was still only 70 miles. Sunday 31st dawned beautiful and bright, and a 5.30am alarm got me to the Olympic Park on time. I found my friend Nikki (no, not that one) who by coincidence had drawn the same start time as me and we were ready to go. The atmosphere was fantastic and our randomly selected start music was ‘Bat out of Hell’, so with Meat Loaf in our ears we crossed the line. Cycling through London with no traffic is an amazing experience, just the sound of cycle wheels humming – to start with you forget that you can ride on the wrong side of the road! Pulled along by the crowd, a bit of chat and learning how to ‘get a lift’ with other cycling groups (or drafting as the pros call it) meant the first forty miles flew by, and we were averaging around 20 miles an hour. At Ripley this came to an end as we had to stop for an hour as the road was closed due to an accident and after we got started again we felt we were now into a serious ride. Next challenge up, the infamous Leith Hill – a one mile, 8% climb which maxes out at an impressive 18% gradient – a monster. Head down and determined to make it to the top I attacked the hill – and felt it every bit of the way. But the descent was worth it, great fun. Box Hill quickly followed but that seemed tame in comparison. Now at roughly 65 miles this was the point in the ride when I realise that there was still quite a long way to go and had to dig deep to get the miles to tick up. My reward was that at 90 miles the ride passed through Wimbledon where I used to live, great to cycle through it and also know I was nearly there. The last ten miles were amazing, cycling through central London; down the Embankment, through Westminster, round Trafalgar Square and finally up the Mall to the roar of the crowds and cross the line in front of Buckingham Palace. Absolutely shattered! I set out to try and finish in under 6 hours, and whilst my official time wasn’t great because of stoppage, I was really pleased that my ‘cycling’ time was 5 hours and 45 minutes. And I raised £415 for Cancer Research – brilliant! I registered for 2017 the day the ballot opened – fingers crossed!